I have been engaged in the anti-nuclear power movement since 1976. Immediately after the disastrous nuclear accident that occurred at Fukushima Daiichi Nuclear Power Station in March 2011, I deeply regretted the way I conducted anti-nuclear campaigns and was seriously worried about Japan’s future. I was so upset that I could not settle down to do anything else at the time. However, I decided to continue with my activities because I felt some kind of responsibility, as an anti-nuclear power activist, for failing to take effective action to prevent the accident. In the spring of 2012, along with other citizens, I launched the “Minamata Citizens Group for Considering Nuclear Evacuation Plans,” with a policy to do whatever we could to stop the restart of nuclear plants. We took two different approaches, holding direct negotiations with nuclear power plant operators, and actively lobbying local government officials. Minamata City in Kumamoto Prefecture, where we live, is well-known as a place where more than two thousand residents suffered Minamata disease caused by mercury poisoning from a Chisso Corporation chemical plant many decades ago. The “economic prosperity first” policy was the main cause of this tragic incident. The Minamata citizens are, therefore, fully aware of the disastrous consequences of industrial pollution. They know that once such pollution occurs, it will inflict irreversible damage on local residents. Due to this painful experience, local citizens stood up to express their opposition to nuclear power generation. In fact, many Minamata disease patients are taking part in our campaigns. When we evacuate, the major concerns that come to mind first of all are more or less as follows: Means of transport for evacuation, traffic congestion, blocked or cut-off evacuation routes when a natural disaster occurs simultaneously with a devastating nuclear plant accident, revision of evacuation routes when the wind direction changes, how we transmit evacuation warnings and other related information to local residents, how we evacuate the sick, hospital patients, elderly or handicapped people and others who need support, not to mention the problems involved in long-term evacuation. Initially, we were so eager to quickly achieve the departure from nuclear power generation that we wished to totally deny nuclear power plants in our campaigns. We came to the conclusion, however, that a more moderate approach would be effective to win support from a greater number of citizens. We firstly decided to assert the need to formulate “more viable and effective evacuation plans.” In line with this policy, we began visiting officials of the Minamata City government, Kumamoto Prefectural government and Kagoshima Prefectural government, and urged them to draw up such evacuation plans. On another occasion, we held lecture meetings by inviting experts on evacuation and people affected by the Fukushima nuclear accident. At the same time, we began negotiations with the electric power companies that operate nuclear power stations. In the wake of the Fukushima nuclear accident, we had hoped that the devastating accident would press Japan to move toward a nuclear power-free society. The reality was that the Sendai Nuclear Power Station, which is located only 40 kilometers from Minamata, became Japan’s first nuclear plant to resume operation. It became operational in August 2015. 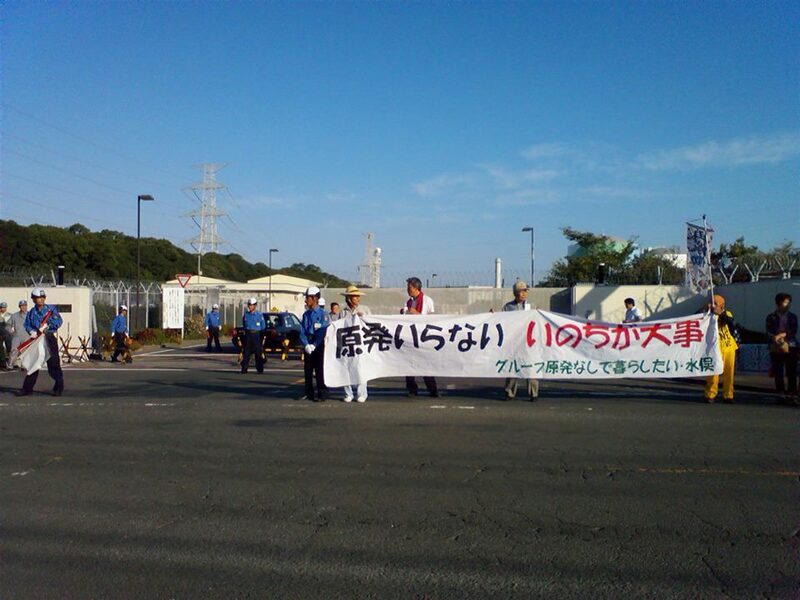 A long time has passed since I began participating in anti-nuclear plant campaigns. During that time, I have experienced ups and downs in the movement. There are various problems in our society, but I have a feeling that the problem of nuclear power plants is the most serious one. After feeling great regret and fear in the wake of the Fukushima nuclear accident, I strongly feel that nuclear power plants should be decommissioned. Based on this belief, I wish to continue anti-nuclear plant activities in the future.